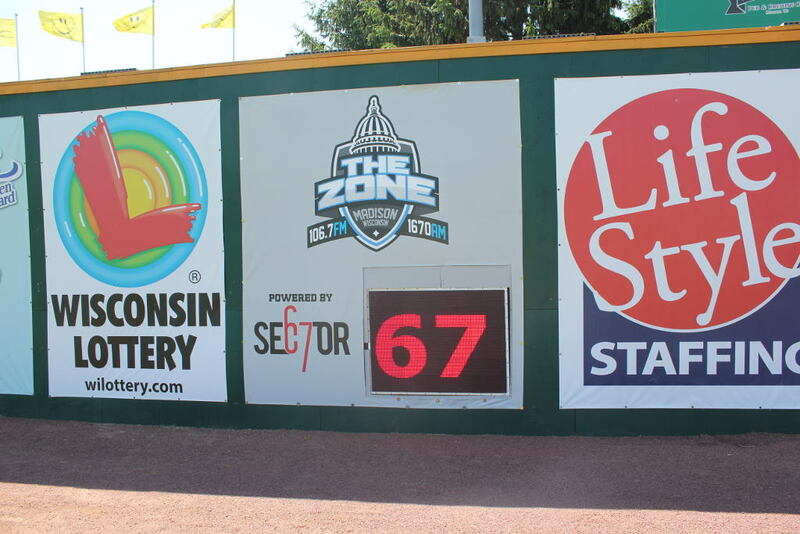 My hackerspace Sector67 was approached this winter with a problem; the local minor league baseball stadium (Madison Mallards) fast pitch sign was old and no longer working, and they wanted some help fixing it up. In exchange for our expertise, they promised significant advertising and publicity, and they would have us be special guests at a ‘maker’ day during the season. We took them up on the offer and had a field trip to the stadium to see what was already there. There are two main parts to this project. First, there’s the sign itself. 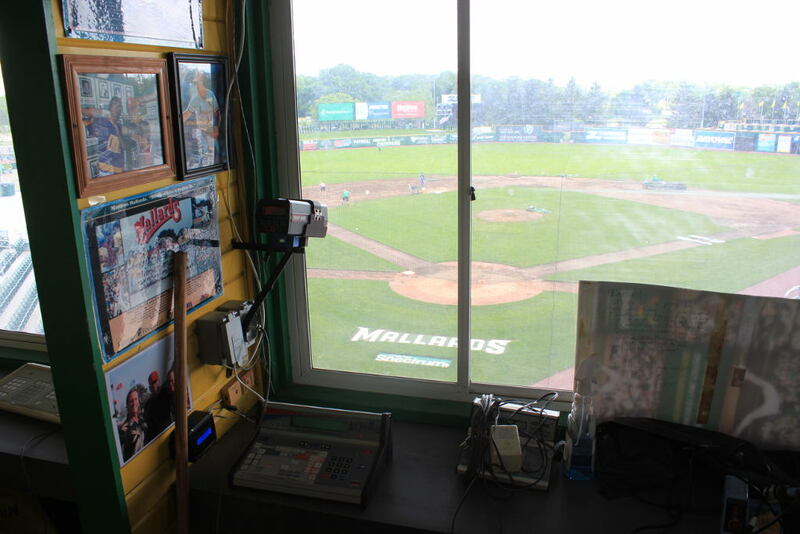 Second, there’s the press box, where the radar gun and the sign controller sit. 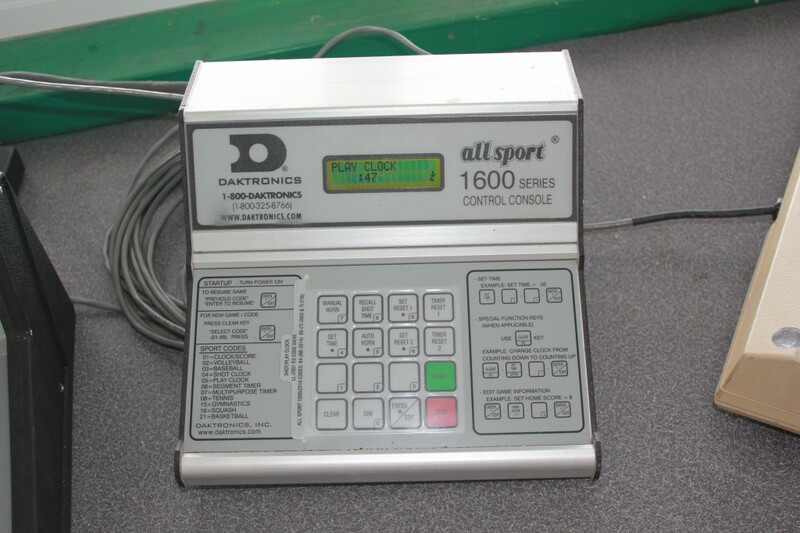 The previous method was to have the person running the scoreboard watch the radar gun and type the speed onto a controller. There was no accounting for the angle of the radar gun, and it required a person to act as the middle man. They wanted to automate this part of the process. With the sign, they wanted it to work again. After seeing their existing setup, it didn’t take long for us to decide they needed an upgrade and we would start from scratch. 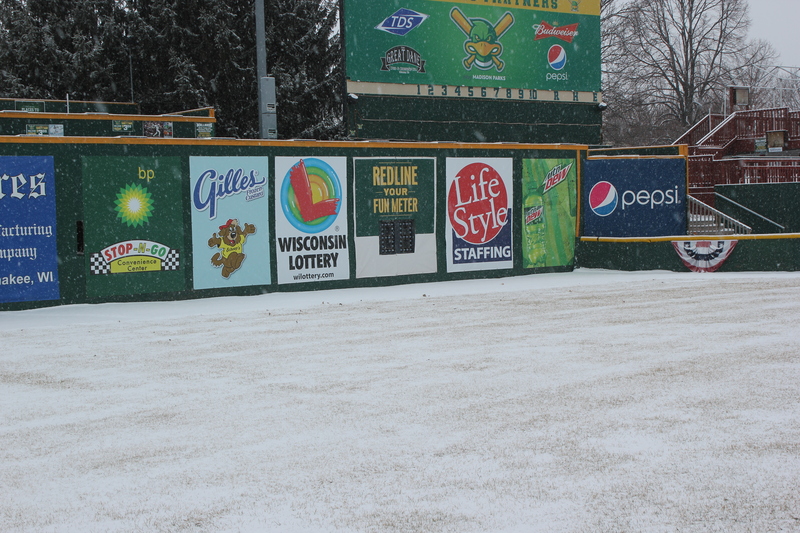 The sign in right field. Doesn’t look very big from this shot, but it’s legible from the far side of the stands. Up close you can see it’s a bunch of incandescent bulbs. They’re not even covered! I wouldn’t want to run into that sign while catching a ball. 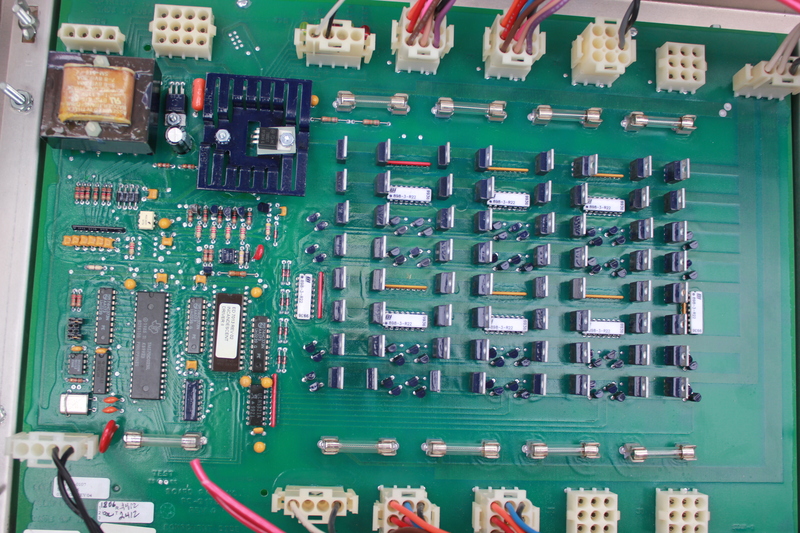 The electronics controlling the sign. This is basic and ancient stuff here. Up in the press box, this is what controls the sign. 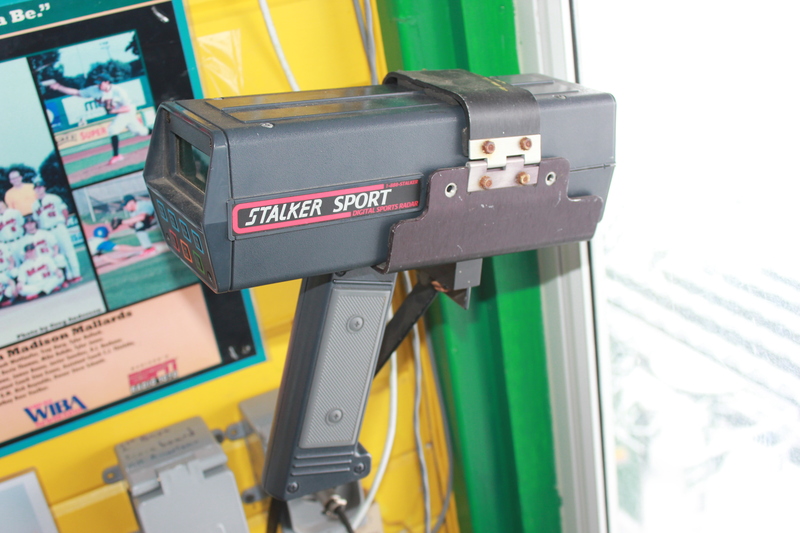 This is the radar gun. They have to charge up the battery (the handle) before every game. This is a pain. 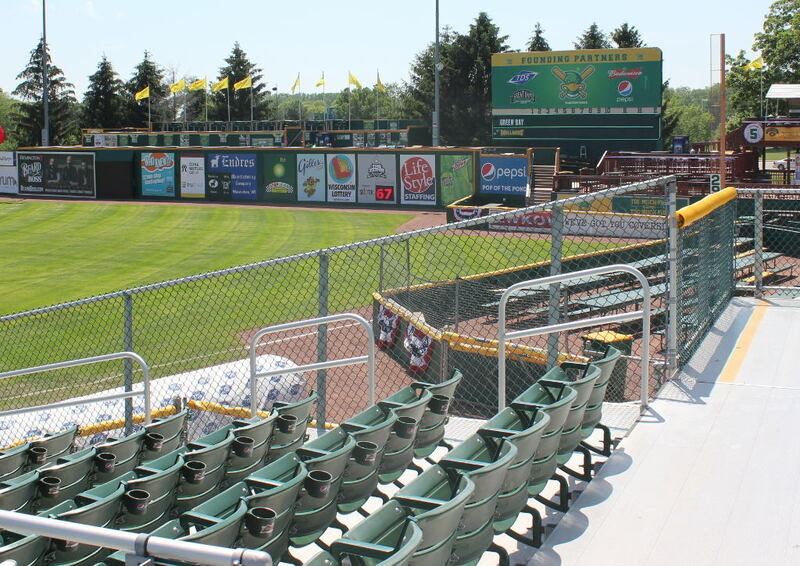 The stadium let us borrow the radar gun, the only part of the process we intended to keep. Reverse engineering it wasn’t too bad. We were able to find a manual and figure out that the three pins coming out into the handle were two for the battery and one for a serial signal. Once we connected to this signal, it was trivial to decipher it (9600 baud ASCII text). We designed a 3D printed part that would take the place of the handle and supply power to the radar gun as well as grab the serial signal. Yes, those are nails. They worked perfect. After that was the box to replace the controller. This box would read in the serial signal, compensate for the angle, and send out a signal to the sign. At first we played with XBee for a wireless transfer. This ended up being so unreliable and so difficult to get set up that we decided to give up. 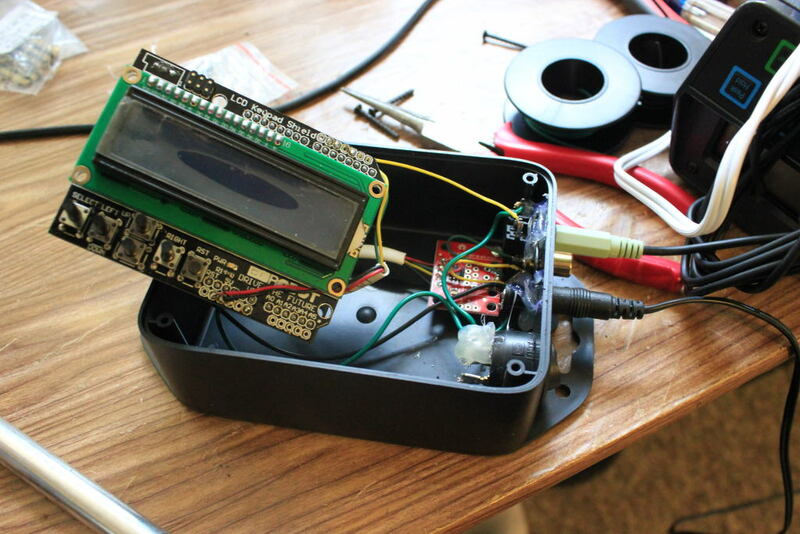 Besides, long term support is important for this kind of a project, and something wireless is a lot more difficult to diagnose and debug than wired. So we went with RS485, which is perfect for long distances, and there was already a pre-existing cable from the previous sign. I threw in a screen and some buttons for good measure (to let the user adjust the angle), and a switch to turn it all on, and we were good to go. Now the only thing a user has to do is flip the switch to turn it on, then push the power button on the radar gun, and it works. The view from the press box. 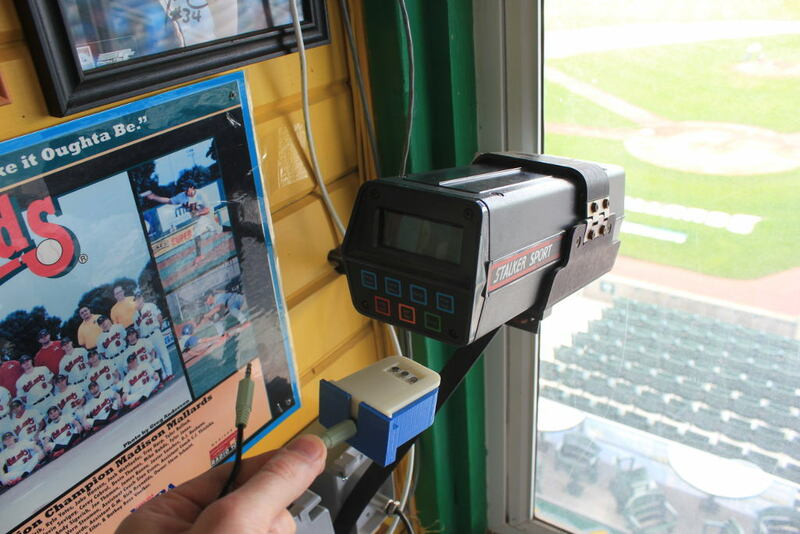 The radar gun captures every pitch, the controller box is mounted on the wall, and the previous controller is wrapped up on the desk. The controller box. There’s a screen, buttons, and power switch. The cables are for power in, power/serial to the radar gun, and RS485 out to the sign. Inside the controller. An arduino with LCD/button shield, a RS485 breakout, and wires. Next was coming up with a sign. We’ve used the P10 red LED modules before on the bar bike, so we had some experience. For this one we purchased the outdoor waterproof ones. We also got power supplies and a controller card. There is some code on the web for controlling these guys directly, but it’s a lot of work and I didn’t have the time or inclination to figure it out. So we went with the controller card. I should note that the prices for these parts is ridiculously cheap. The LED modules are $6.50, the power supplies are $8, and the controller card was $50. So we had all the major components for the sign for just a few hundred dollars, and that’s because we ordered extras of everything in case of failures. 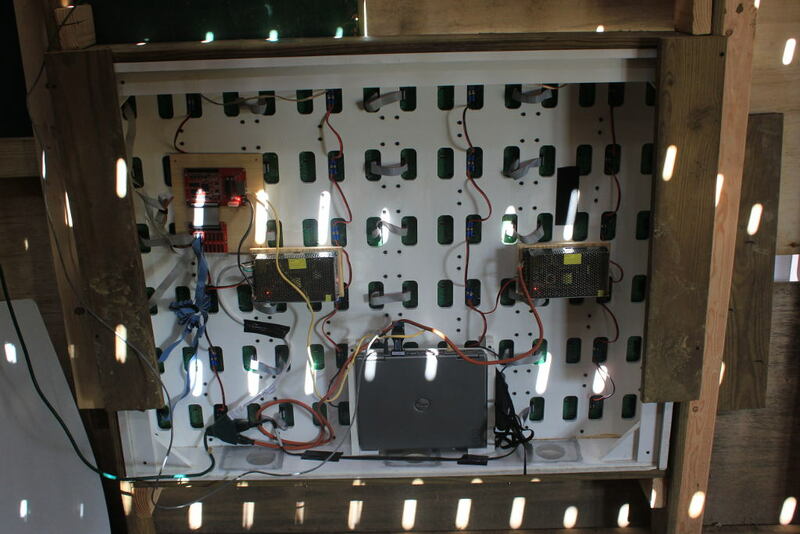 We designed and cut an enclosure and attached the modules to the frame, then wired everything up. 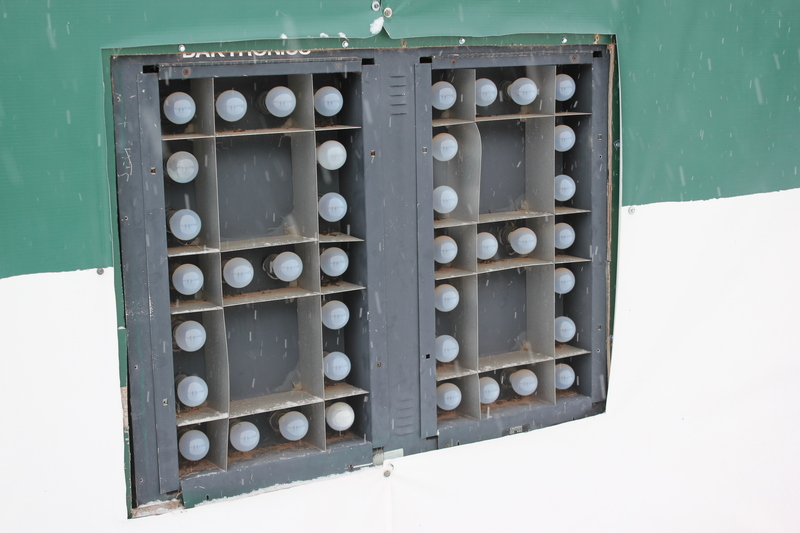 The wiring is simple; power up each column, data across each row. Two power supplies power two columns each. Getting the controller card working was tricky, though. There is no documentation on the protocol, so I tried sniffing the packets being sent to it, but couldn’t make sense of them. There was no API, and after repeatedly pressing the Chinese company for resources, they sent some sample code and a dll, but it would only work on windows. We were trying to avoid Windows and go with a cheap (and low power) linux PC or Raspberry Pi, but in the interest of time, we ended up bailing on that and just getting a very old and cheap Windows XP laptop. Fortunately, it had a serial port, so we could hook a RS485 to RS232 converter to it and we were able to communicate quickly with the press box. 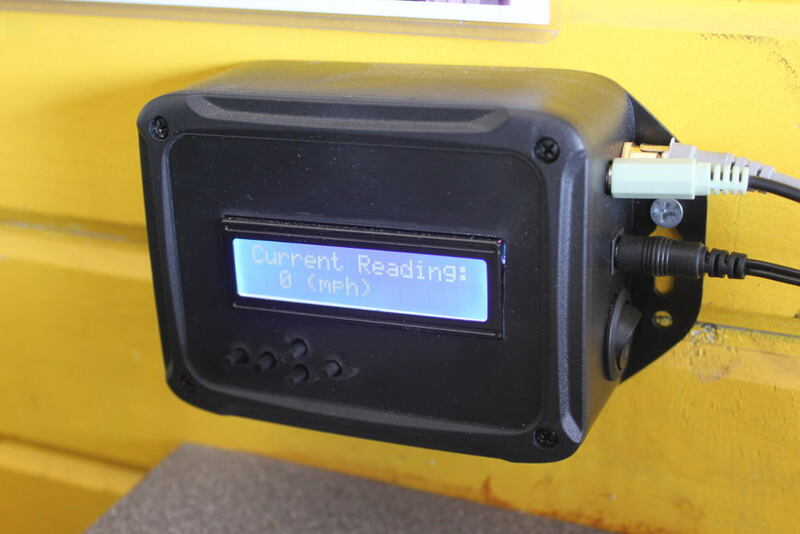 The controller card comes with some windows software for setting up the sign and displaying content, but it was difficult to get it to show real time data. What we ended up doing was writing a python script which would monitor the serial port and upon receiving a speed would write that speed to a file. One of the options in the other software for controlling the sign (called LEDSHOWT9), was to display the contents of a file, and update every N seconds. So we picked that option. Now every few seconds LEDSHOWT9 will look at the file, and take the contents (either the speed or a blank), and show that on the sign. Tada! It’s a hack, but it works. If inclined, maybe I’ll write up something better and do animations or something. But probably not. Clearly visible during the day from the stands. Pretty font, works automatically. Complete success.